The casserole you were cooking in the oven either did not cook all the way or it burned. The temperature is set correctly, but the heat did not operate correctly. Now you want to know how to tell if the oven heating element or the thermostat is at fault. The only way to determine this is to test both the heating element and the thermostat, and replace the one that is faulty. Disconnect the oven from the wall outlet. Open the oven door, and remove the oven racks. Use a Phillips head screwdriver to remove the two screws that secure the bake heating element to the back of the oven wall. Pull the bake heating element out of the wall enough to see the wire terminal connections. Use needle nose pliers to remove the wires from the bake heating element terminals. Make sure to grab the wire at the leads to remove them. Grabbing the wires at any other spot could cause the wire to break. Set the volt-ohm meter to the RX1 scale to check for continuity within the bake heating element. Touch one probe of the volt-ohm meter to one element terminal and the other probe to the other element terminal. You should see a reading between 20-ohms and 115-ohms. If you do not get a reading, the heating element is faulty. Unplug the oven from the wall outlet. Pull the oven away from the wall so that you have room ro work behind it. If your unit has anti-tip clips in the floor, tip the rear of the oven up, and pull it forward. 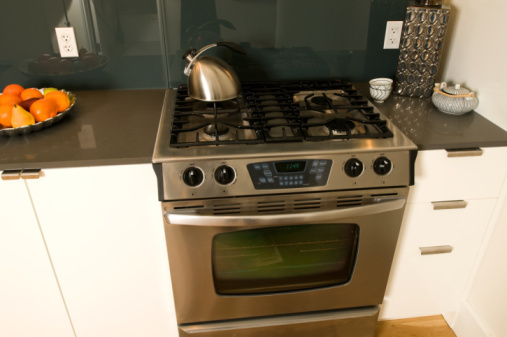 Use a Phillips head screwdriver to remove the screws that secure the back panel of the oven. Remove the back panel, and set it out of your way. Use needle nose pliers to remove the wire leads from the thermostat terminals. The thermostat is located right behind the oven temperature control knob. Set the Volt-ohm meter to RX1, and touch one probe to each of the two terminals on the thermostat. A zero reading indicates a faulty thermostat.